Because healthy food is expensive, when times are tight, the first items to be eliminated from a family’s grocery list are inevitably the most nutritious. Out of necessity, boxes of pasta, macaroni and cheese, and canned soups are chosen over fresh apples, chicken breast, and milk. As a result, many lower-income families experience nutrition related health problems. It is the mission of the Second Harvest Food Bank of the Lehigh Valley and Northeast Pennsylvania to provide high-quality and nutritious foods to families who cannot afford them. Thanks to the Rotary Club of Bethlehem, the County of Northampton, the Walt Disney Company, the Sylvia Perkin Charitable Trust, and generous individuals, Second Harvest Food Bank recently purchased its first refrigerated truck, which means many lower-income families will now have greater access to fresh fruits, vegetables, milk, eggs, meat, and produce. In September, 2015, Second Harvest relocated from a facility it had outgrown in Allentown to a much larger warehouse in East Allen Township. The new facility allows for a 400% increase in refrigerated and frozen storage space, enabling Second Harvest to increase its capacity to accept and store the healthy and perishable products it provides to its 200 non-profit member agencies, which include emergency food pantries, soup kitchens, shelters, and child-care and rehabilitation centers. The refrigerated truck was the final piece needed to complete the cycle from producer to consumer. The food bank is able to safely distribute the perishable product it now has the capacity to store. Families will no longer miss out on access to high-quality and nutritious foods. Feeding Families Ministry, a Second Harvest member agency located in Mount Pocono, serves approximately 600 people each month. 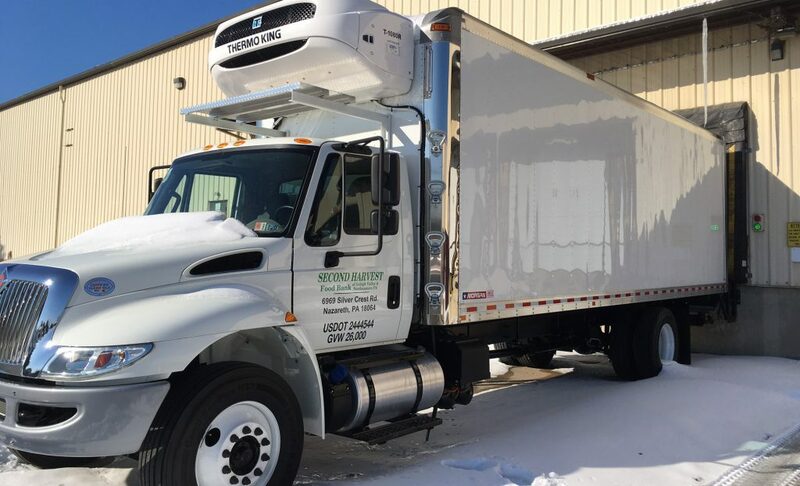 Founder Diane McFadzean, has been eagerly anticipating the addition of the new refrigerated truck. “We are excited to provide more of our families with fresh milk, eggs, and produce. Right now, we are relying on volunteers with pick-up trucks and minivans to pick up our food from Second Harvest, and they are not able to transport perishable foods. We were especially saddened during the summer months, because we could not accept any of the fresh produce that is available,” said McFadzean. Second Harvest Food Bank of the Lehigh Valley and Northeast Pennsylvania distributes food and grocery product to more than 65,000 people in need each month through a network of more than 200 non-profit member agencies in Carbon, Lehigh, Monroe, Northampton, Pike, and Wayne counties. The non-profit network includes emergency food pantries, soup kitchens, shelters, and child-care and rehabilitation centers. Last year, Second Harvest distributed nearly nine million pounds of food. In addition to food distribution, Second Harvest provides resources for education and advocacy to end hunger. Second Harvest Food Bank is a program of the Community Action Committee of the Lehigh Valley (CACLV) and is a member of Feeding America, the nation’s food bank network and largest hunger relief organization.